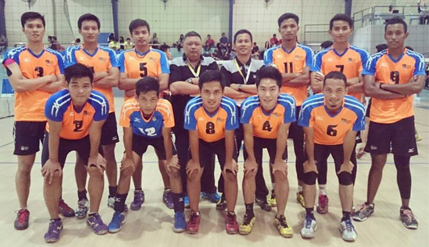 SHAH ALAM, Selangor, 17 Feb 2014 – The National University Of Malaysia (UKM) has again emerged as volleyball champions in the recently-concluded university games (SUKIPT) at Universiti Tekonologi MARA, Shah Alam. This was the eighth time in a row the UKM team won the event when they cruised to a 3-0 victory over Universiti Putra Malaysia (UPM) in the final. SUKIPT was held from 5th to 11th February 2014. UKM had first won the title at the Malaysian Universities Sports Council Championship (MASUM) in 2006. Team manager Major Mohd Jasmy Abdul Rahman attributed the success to the team spirit and the high level of discipline of all the players. He said the players never tire of going for their practice and hoped that UKM will take part in more competitions this year such as the UTM Open, Batam Open and MASUM with the support of the UKM Sports Centre.